With snow falling steadily and the temperature well below freezing, Minnesota Sen. Amy Klobuchar said she’s joining the group of Democrats running for president and would take her campaign — and her Midwest sensibilities — directly to parts of the region Donald Trump won and that her party wants to recapture in 2020. Klobuchar, who easily won a third-term last year, is the most prominent candidate from the Midwest to enter the race. She’s pointed to her broad appeal across Minnesota — where she’s drawn support from voters in urban, suburban and rural areas, including in dozens of counties Trump won in 2016 — and says that success could translate to other Midwestern states such as Michigan and Wisconsin, reliably Democratic in presidential races for decades until Trump’s victory over Hillary Clinton. 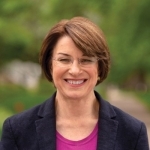 Klobuchar said she would travel next weekend to Iowa, home to the nation’s first caucus, joking it’s “a place where we in Minnesota like to go south for the winter.” That trip will be followed by stops in Wisconsin, where Clinton was criticized in 2016 for not spending enough time.